We have salmon once a week, every week. It’s one of my favorite types of fish. We had quite a bit leftover the other night and I saved it so I could have a salmon salad the next day. Well the next day came and I wasn’t quite in the mood for a salmon salad. I love crab cakes so I thought, why not try the same method with my leftover salmon? These cakes were super easy to make and clean-up was a breeze because I prepared them in just one bowl. All I did was flake up the salmon with a fork, add one egg, sprinkle in a bit of bread crumbs and Parmesan cheese until the mixture wasn’t too wet or too dry, add some seasonings (minced garlic, sea salt and pepper), shape into patties, cook in a skillet, and that was it, done. 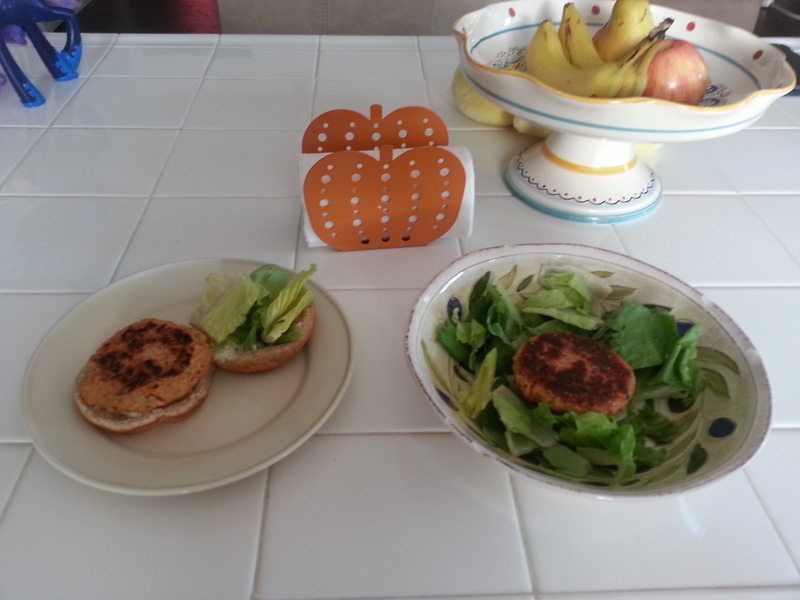 I couldn’t decide if I wanted a salmon cake sandwich or salad so I made both – I was taste testing my recipe 🙂 In the end, I preferred the sandwich. I made a simple aioli using mayo and seasonings and added lettuce and tomato. Typically, I do not eat big lunches or things that take long to prepare so this was a nice break from my standard lunch fare. ← My Italian pot roast.